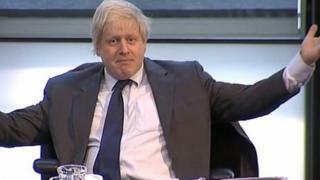 A parliament committee has called for the London Assembly to have greater powers to challenge Boris Johnson. The Communities and Local Government Select Committee recommended the assembly be able to call in mayoral decisions before they are implemented and capital and revenue budgets. It should also be able to reject the appointment of a deputy mayor, it said. London Assembly chairman Darren Johnson said he would watch for a ministerial response. The Communities and Local Government Select Committee is appointed by the House of Commons to examine the Department for Communities and Local Government. Its report said legislation enacted in 2007 and 2011 transferred more powers to the mayor but not the London Assembly - the body of 25 elected members that scrutinises the mayor's policies and decisions. Committee chairman Clive Betts MP called the current situation "a dog's dinner". He said: "The mayor must be held to account for the substantial powers invested in him. "The London Assembly is the right vehicle to do this, but not in its current form." It also recommends that assembly members who join the mayor's cabinet or sit on Greater London Authority (GLA) boards be required to give up their assembly membership. It also wants the London Fire and Emergency Planning Authority to be reconstituted along the lines of the Mayor's Office for Policing and Crime established last year, with a deputy mayor for fire and emergency planning and a dedicated assembly committee to scrutinise it. Darren Johnson, chair of the London Assembly, said: "I am grateful to the committee for taking up so many of the assembly's recommendations for achieving greater consistency and transparency at the GLA. "In particular, the proposal to give the assembly the power to call in the mayor's decisions for examination before they are implemented, as well as a greater say over how the mayor spends Londoners' money." Recently both Boris Johnson and London Assembly members have publicly shown exasperation at Mayor's Question Time sessions over fire cuts scrutiny. Last month he told Labour assembly member Andrew Dismore to "get stuffed" after he had asked the mayor to justify his decision to close 10 fire stations and cut 552 firefighters' posts. In February, Mr Johnson called assembly members "great, supine, protoplasmic invertebrate jellies" for voting not to question him over his budget which included fire and police cuts.